RioCan REIT (REI-UN-T) completed 119,000 square feet of development in the second quarter, and there’s plenty more to come over the next few years as it unlocks further value in its properties. “Overall, RioCan is focused on developing mixed-use, transit-orientated properties in Canada’s major markets,” said Terri Andrianopoulos, RioCan’s vice-president of marketing and communications. Andrianopoulos was speaking with RENX to provide an update on the trust’s many projects in Toronto, the Greater Toronto Area and across Ontario. RioCan has staggered its development program to avoid an unnecessary concentration of projects in order to allocate risks and personnel and manage its capital. “From Q3 2018 to the end of 2020, we expect development completions (across Canada) of approximately 2.8 million square feet at 100 per cent, or 1.6 million square feet at RioCan’s interest, net of air right sales,” said RioCan chief operating officer Jonathan Gitlin during the company’s second-quarter earnings call on Aug. 8. RioCan and partner Allied Properties REIT (AP-UN-T) most recently completed the redevelopment of a three-storey heritage building at 491 College St. in Toronto. It has a restored façade and is fully leased with a 7,500-square-foot LCBO store and 16,000 square feet of office space occupied by Arrivals & Departures and Genuine Health. RioCan’s pipeline of developments in Toronto is significant. * RioCan and Allied have confirmed lease commitments representing 30 per cent of the gross leasable area at The Well, a mixed-use project in the western part of downtown Toronto which will include 1.1 million square feet of office, 500,000 square feet of retail and food services, and 1,800 residential rental and condominium units spread throughout seven buildings, connected to a three-level retail base. Woodbourne Capital Management owns a 50 per cent stake in the residential rental component. * Sobeys and other tenants took possession at Toronto’s Bathurst College Centre during the past quarter, and the project is scheduled for completion this fall. It features 80,000 square feet of retail on the first two floors and 69,000 square feet of office space on the third and fourth floors. RioCan announced last week that the site is 98 per cent leased, with the addition of a technology company which has leased 28,000 square feet. University Health Network will occupy an additional 40,000 square feet. * ePlace is a mixed-use development featuring two storeys of retail and two storeys of office space at the corner of Yonge Street and Eglinton Avenue in Toronto. A fully pre-sold 58-storey, 623-unit condominium called e2 and a 36-storey, 466-unit rental residence called eCentral, located off of Yonge at Roehampton Avenue, round out the development. The project, a partnership with Metropia and Bazis, is close to substantial completion. Marketing for eCentral is expected to start within months. * Toronto’s King Portland Centre is also nearing substantial completion. The project, another RioCan and Allied partnership, will feature 273,000 square feet of office space on 14 floors. Shopify (SHOP-T) will occupy 183,000 square feet and Indigo has claimed 79,000 square feet. King Portland Centre also encompasses the 132-unit Kingly Condos and an existing three-storey commercial building with office and retail. * A four-storey restored brick-and-beam building with 15,000 square feet of retail and 11,000 square feet of office space at 642 King St. W. in Toronto is slated for completion this fall. It’s another 50-50 venture between RioCan and Allied. * North Toronto’s Yonge Sheppard Centre will have 305,000 square feet of retail space topped by 400,000 square feet of office space. It’s scheduled for a spring 2019 completion. The development also includes Pivot, a 36-storey rental residential tower consisting of 361 units, which should be finished in the spring of 2020. KingSett Capital is a 50 per cent partner. 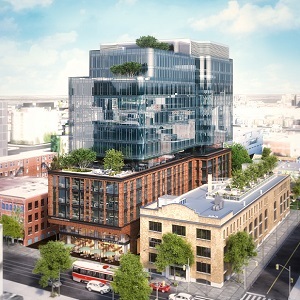 * Litho is an eight-storey, 210-unit residential development with 35,000 square feet of retail at street level which is targeting a spring 2020 completion at 740 Dupont St. It’s 50 per cent owned with Woodbourne. * Strada, featuring seven storeys and 65 residential units above 5,600 square feet of retail space at 555 College St. in Toronto, is scheduled for completion in the summer of 2020. It’s another joint project with Allied. “The Toronto market is just one example of the tremendous value that exists in the portfolio that will be realized in the next decade through our urban intensification and residential development programs in major markets across Canada,” Gitlin said during the earnings call. Construction for phase one of the 551-townhouse project at the 31-acre Windfield Farms site in Oshawa started in the second quarter, with first occupancy expected next year. The three-phase project, also known as UC Towns 2, is a joint venture with Tribute Communities. Of the 170 units released in phase one, 166 have been pre-sold, as have 14 of the 94 units in phase two. The Frontier purpose-built rental apartment tower in East Ottawa is on schedule to be completed in early 2019. The 23-storey, 228-unit development is close to transit, entertainment, retail and restaurants in the Gloucester area. The project, which could ultimately include three residential towers on the 7.1-acre site, is half-owned by Killam Apartment REIT (KMP-UN-T) . Despite rent control legislation introduced by the Ontario government in May 2017 which extended controls to all residential rental units regardless of when they were built, RioCan remains committed to a rental residential development program. It’s looking to develop approximately 10,000 units during the next decade. RioCan is also making good progress on obtaining zoning approvals. At the end of June, 46.3 per cent of its development pipeline (12.1 million square feet) was zoned. Applications had been submitted for a further 20.6 per cent (5.4 million square feet) of the proposed sites. The extent of approved zoning density is valuable, especially in Toronto, where changes in the zoning approval process are leading to longer approval times and more uncertainties. A further 16 projects with 8.7 million square feet of space have been identified as future density. Other intensification opportunities, not included in those figures, also exist within RioCan’s portfolio. RioCan is one of Canada’s largest real estate investment trusts, with a total enterprise value of approximately $13.7 billion as of June 30. Its portfolio is comprised of 267 properties, including 17 development properties, with an aggregate net leasable area of approximately 42 million square feet.